This product has been classified as being VAT exemptible for eligable registered Charities. Please check our guidelines on eligability. In residential environments including care homes, our Disposable Draw Sheets 80 x 140cm offer a single, use option to your bed making needs. 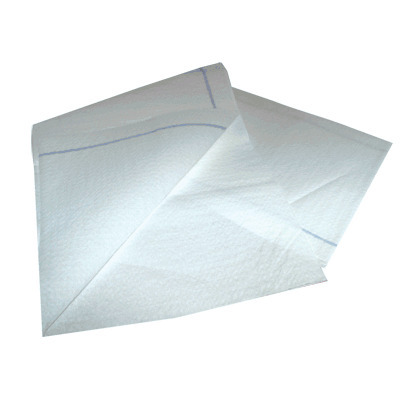 Designed to be placed at the centre of the bed, each sheet has been manufactured from a highly absorbent 1 and 2 ply creped pure cellulose tissue that has been laminated with an impervious polyethene film. Finished with an airland tissue base, these draw sheets not only work hard to draw in as much moisture as possible, they also feel gentle to the touch and have a high durability for all night use. Each sheet has also been reinforced with polyester threads along the edges to ensure reliable function with every resident. If you're looking for extra protection, we also have a range of Waterproof Bedding options to suit each need perfectly.